Introduction: The First Battle of Ream's Station was fought on June 29, 1864, during the Wilson-Kautz Raid of the American Civil War. Confederate forces under Maj. Gen. William Mahone and Brig. Gen. Fitzhugh Lee defeated Union cavalry raiding Confederate railroads south of Petersburg, Virginia. The exhausted Union raiders had moved toward Ream's Station expecting it to be in friendly hands, but finding themselves almost surrounded and under attack by Confederate infantry under Brig. Gen. William Mahone and Lee's relentless pursuit, brigade commanders Wilson and Kautz were forced to abandon their artillery, burn their remaining supply wagons, and separated, attempt breakouts eastward toward Union forces under Maj. Gen. Benjamin F. Butler. Kautz's brigade moved cross country toward the southeast, where it met friendly lines after sundown. After suffering heavy casualties, Wilson's brigade withdrew to the southwest, circling eastward again to recross the Nottoway River and finally northward to safety at Light House Point on July 2. Summary: Early morning June 29, Brig. Gen. August Kautz’s division reached Reams Station on the Weldon Railroad, which was thought to be held by Union infantry. Instead, Kautz found the road barred by Mahone’s Confederate infantry division. Wilson’s division, fighting against elements of William H. F. “Rooney” Lee’s cavalry, joined Kautz’s near Reams Station, where they were virtually surrounded. About noon, Mahone’s infantry assaulted their front while Fitzhugh Lee’s cavalry division threatened the Union left flank. The raiders burned their wagons and abandoned their artillery. Separated by the Confederate attacks, Wilson and his men cut their way through and fled south on the Stage Road to cross Nottoway River, while Kautz went cross-country, reaching Federal lines at Petersburg about dark. Wilson continued east to the Blackwater River before turning north, eventually reaching Union lines at Light House Point on July 2. The Wilson-Kautz raid tore up more than 60 miles of track, temporarily disrupting rail traffic into Petersburg, but at a great cost in men and mounts. Battle: In June 1864, a Union division under the command of Brig. Gen. August V. Kautz moved into southern Virginia where they began destroying sections of the Wilmington and Weldon Railroad as part of the Richmond-Petersburg Campaign. On June 29 the division reached Ream's Station south of Petersburg on the Weldon Railroad, which was thought to be held by Union infantry. Instead, Kautz found the road barred by Mahone's Confederate infantry division. Wilson's division, fighting against elements of Maj. Gen. W.H.F. "Rooney" Lee's cavalry, joined Kautz's near Ream's Station, where they were virtually surrounded. Around noon, Mahone led Confederate infantry against the Union front while cavalry under Fitzhugh Lee attacked the Union left flank. The fierce assault split the Union forces. Wilson and Kautz were forced to withdraw quickly, burning their supply wagons and abandoning their artillery. Separated by the Confederate attacks, Wilson and his men cut their way through and retreated southwest on the Stage Road to cross the Nottoway River, while Kautz headed south and east cross-country, reaching Federal lines at Petersburg about dark. Wilson continued east to the Blackwater River before turning north, eventually reaching Union lines at Light House Point on July 2. The Wilson-Kautz raid tore up more than 60 miles of track, temporarily disrupting rail traffic into Petersburg, but at a great cost in men and mounts. 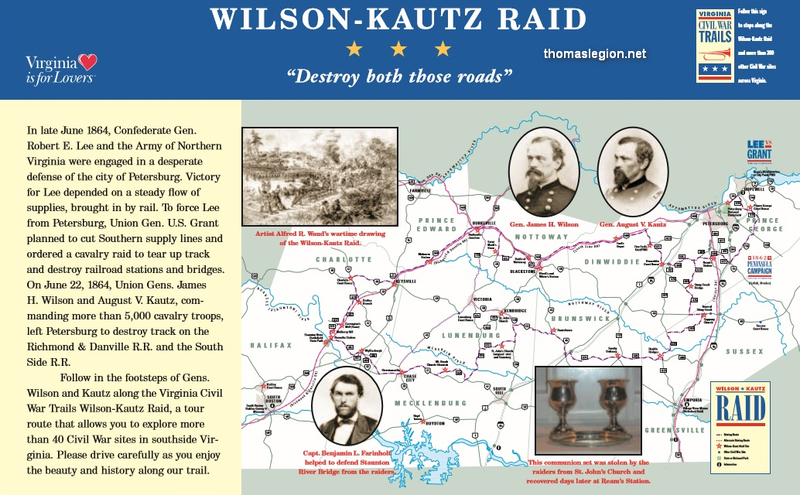 The Wilson-Kautz Raid: The Wilson–Kautz Raid was a cavalry operation in south central Virginia in late June 1864, during the Civil War. 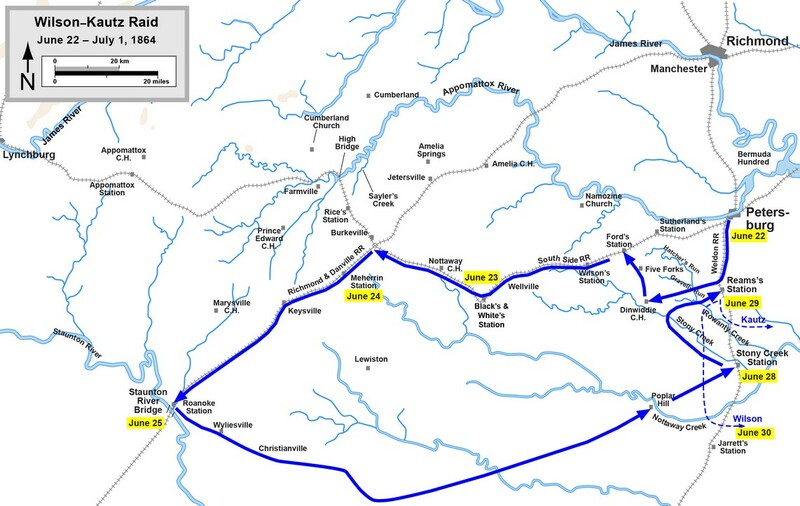 Occurring early in the Richmond-Petersburg Campaign, the raid was conducted by Union cavalry under Brigadier Generals James H. Wilson and August Kautz, who were ordered to cut railroads between Lynchburg, Virginia, and the vital Confederate rail supply center at Petersburg. While the raid had the intended effect of disrupting Confederate rail communications for several weeks, the raiding force lost much of its artillery, all of its supply train, and almost a third of the original force, mostly to Confederate capture. The First Battle of Reams Station was contested during this raid. Background: Immediately following the Overland Campaign, Union Army commander Lt. Gen. Ulysses S. Grant proposed to encircle both the Confederate capitol at Richmond and its strategic supply center ten miles south at Petersburg. While infantry began the entrenchment activities of investment, Grant determined to take advantage of new positions to launch light operations with the objective of disrupting rail activity.On June 22, 5,000 Union cavalry and 16 artillery pieces were pulled from the siege of Petersburg and sent, under the command of Brig. Gens. James H. Wilson and August V. Kautz, to destroy the lines of supply. Battle: In parallel to Birney's and Wright's infantry action at the Jerusalem Plank Road, Brig. 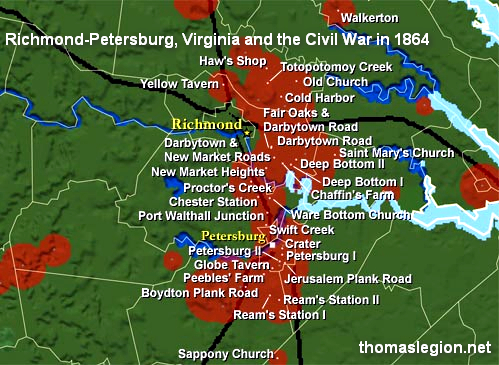 Gen. James H. Wilson was ordered by Meade to conduct a raid destroying as much track as possible south and southwest of Petersburg. Grant considered Wilson's 3rd Division of the Cavalry Corps too small to conduct the operation alone—particularly since Meade required Wilson to leave 1,400 men behind for picket duty—so he directed Butler to contribute Brig. Gen. August Kautz's small division (2,000 troopers) to the effort. Early on the morning of June 22, 3,300 men, and 12 guns organized into two batteries, departed Mount Sinai Church and began to destroy railroad track and cars of the Weldon Railroad at Reams Station, 7 miles south of Petersburg. Kautz's men moved to the west to Ford's Station and began destroying track, locomotives, and cars on the South Side Railroad. On June 23, Wilson proceeded to the junction of the Richmond and Danville Railroad at Burkeville, where he encountered elements of Rooney Lee's cavalry between Nottoway Court House and Black's and White's (modern-day Blackstone). The Confederates struck the rear of his column, forcing Col. George A. Chapman's brigade to fend them off. Wilson followed Kautz along the South Side Railroad, destroying about 30 miles of track as they went. On June 24, while Kautz remained skirmishing around Burkeville, Wilson crossed over to Meherrin Station on the Richmond and Danville and began destroying track. On June 25, Wilson and Kautz continued tearing up track south to the Staunton River Bridge at Roanoke Station (modern-day Randolph), where they encountered approximately 1,000 "Old Men and Boys" (the Home Guard), commanded by Capt. Benjamin L. Farinholt, dug in with earthworks and prepared artillery positions at the bridge. The Battle of Staunton River Bridge was a minor affair in which Kautz attempted multiple frontal assaults against the Home Guard, but his men never came closer than 80 yards. Lee's cavalry division closed on the Federals from the northeast and skirmished with Wilson's rear guard. Casualties on the Union side amounted to 42 killed, 44 wounded, and 30 missing or captured; Confederate losses were 10 killed and 24 wounded. Kautz's men gave up and retreated to the railroad depot at 9 p.m. Despite these relatively minor losses, the two Union cavalry generals decided to abandon their mission, leaving the Staunton River bridge intact and having inflicted only minor damage on the railroads. As Wilson and Kautz turned back to the east after their defeat at Staunton River Bridge, Rooney Lee's cavalry pursued and threatened their rear. Meanwhile, Robert E. Lee ordered Maj. Gen. Wade Hampton's cavalry, which had been engaged with Maj. Gen. Philip H. Sheridan's cavalry at the Battle of Trevilian Station on June 11–12, to join the pursuit and attack Wilson and Kautz. Before leaving on his raid, Wilson had received assurances from Meade's chief of staff, Maj. Gen. Andrew A. Humphreys, that the Army of the Potomac would be immediately taking control of the Weldon Railroad at least as far south as Reams Station, so Wilson decided that would be an appropriate place to return to Union lines. The Union defeat at Jerusalem Plank Road made those assurances inoperable. Wilson and Kautz were surprised on the afternoon of June 28 when they reached Stony Creek Station, 10 miles south of Reams, as hundreds of Hampton's cavalrymen (under Brig. Gen. John R. Chambliss) and infantry blocked their path. In the Battle of Sappony Church, Wilson's men tried to break through, but had to fall back when Confederate Brig. Gen. Matthew C. Butler and Thomas L. Rosser threatened to envelop Wilson's left flank. Kautz's division, following Wilson's, took a back road in the direction of Reams Station and was attacked by Rooney Lee's division late in the day. The Union cavalrymen were able to slip out of the trap under the cover of darkness and rode north on the Halifax Road for the supposed security of Reams Station. 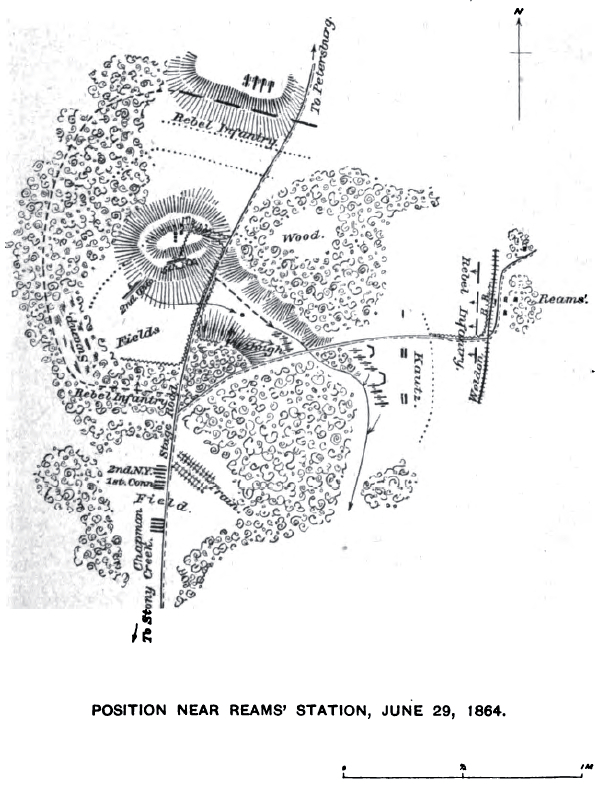 In the First Battle of Reams Station on June 29, Kautz approached Reams Station from the west expecting to find the friendly infantry promised by Humphreys, but found Confederate infantry instead—Mahone's division blocking the approaches to the Halifax Road and the railroad behind well constructed earthworks. Kautz's attack by the 11th Pennsylvania and the 1st District of Columbia Cavalry along the Depot Road was unsuccessful and Mahone counterattacked against the flank of the Pennsylvanians. On the Stage Road to the north of the station, the brigades of Brig. Gen. Lunsford L. Lomax and Williams C. Wickham maneuvered around the 2nd Ohio Cavalry and 5th New York Cavalry, turning the Federal left flank. Wilson sent a messenger north who was able to slip through the Confederate lines and urgently requested help from Meade at City Point. Meade alerted Wright to prepare to move his entire VI Corps to Reams Station, but he realized that it would take too long on foot and requested help from Phil Sheridan's cavalry as well. Sheridan demurred, complaining of the effect on his "worn-out horses and exhausted men." After the war, arguments persisted between Sheridan and Wilson about whether the former had adequately protected the raiders from the Confederate cavalry of Hampton and Fitzhugh Lee. Sheridan did reach Reams Station by 7 p.m., only to find that the VI Corps infantry had in fact arrived but that Wilson and Kautz had departed. Caught in a trap without promise of immediate aid, the Wilson-Kautz raiders burned their wagons and destroyed their artillery pieces and fled to the north before the reinforcements arrived. They lost hundreds of men as prisoners in what was called "a wild skedaddle." At least 300 escaped slaves who had joined the Union cavalrymen during the raid were abandoned during the retreat. The raiders reentered Federal lines around 2 p.m. on July 1. They had destroyed 60 miles of track, which took the Confederate several weeks to repair, but it came at the cost of 1,445 Union casualties, or about a quarter of their force (Wilson lost 33 killed, 108 wounded, and 674 captured or missing; Kautz lost 48 killed, 153 wounded, and 429 captured or missing). Although Wilson counted the raid as a strategic success, Ulysses S. Grant reluctantly described the expedition as a "disaster." Sources: National Park Service; Official Records of the Union and Confederate Armies; Linedecker, Clifford L., ed. Civil War, A-Z: The Complete Handbook of America's Bloodiest Conflict. New York: Ballantine Books, 2002. ISBN 0-89141-878-4; Boatner, Mark Mayo, III (1988) . The Civil War Dictionary. New York. ISBN 0-8129-1726-X; Jordan, Ervin L. (1995). Black Confederates and Afro-Yankees in Civil War Virginia. University of Virginia Press. ISBN 0-8139-1545-7; Longacre, Edward G. (2000). Lincoln's cavalrymen. Stackpole Books. ISBN 0-8117-1049-1; Wittenberg, Eric J.; Rhea, Gordon C. (2007). Glory Enough for All: Sheridan's Second Raid and the Battle of Trevilian Station. University of Nebraska Press. ISBN 0-8032-5967-0.